On the weekend of 2 – 4 December an exciting new phase of the Spodden Valley Revealed project started, with field survey work by Archaeology team Dig Ventures and volunteer Explorers. Starting out from Whitworth Library and Whitworth Museum the team recorded heritage sites such as Facit Incline and Peel Chimney, Healey Dell, Cowm Reservoir and a ruined farm and exciting standing stones at Brown Wardle. It was such a great weekend, especially with our younger Explorers who really enjoyed being a part of the team, learning new skills and getting out into the wonderful landscape of Whitworth. Keep an eye out in the New Year for more family based archaeology activities and for more ways you can get involved. For more information email Diana Hamilton, visit the webpage and follow us on Facebook. The final day! Leaving Evreux this morning the pelaton headed East through charming traditional French towns and villages, stopping for lunch at Septeuil. Then it was one last push, or hopefully peddle, as they headed towards the finish line. 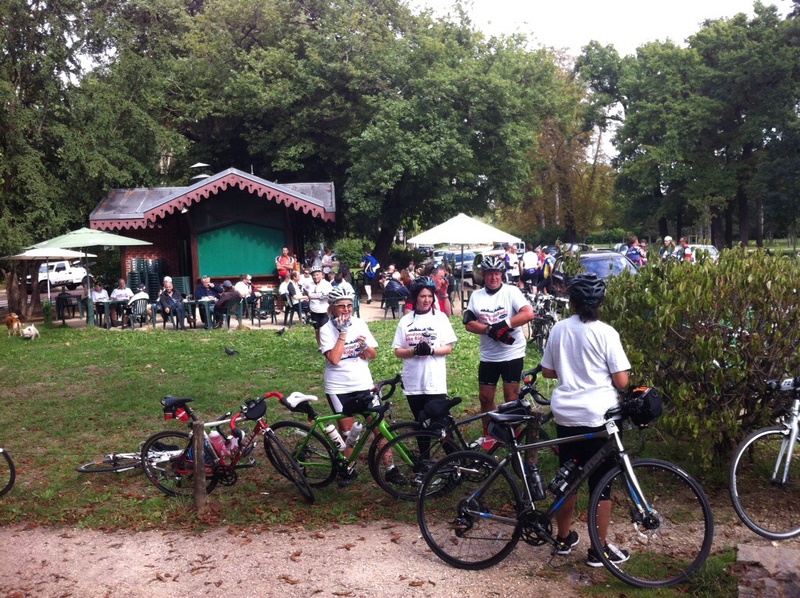 On reaching Paris the 120 riders regrouped at the Bois de Boulogne, a large public park located along the western edge of the 16th arrondissement, so that they could all cycle together along the Champs-Elysee, around the Arc de Triomphe and onto the Eiffel Tower and the finishing line. A very well deserved glass of champagne as reward for making it that far, and Nick and his compatriots could finally relax. They also had the official group photos taken, which we will share with you when we get them. Tonight, after a chance to freshen up they will all get together for a well earned celebratory dinner. Tomorrow Nick has a free morning in Paris, the team think that, should he be able to move, he’s bound to head for the nearest art gallery, or cafe, or preferably an art gallery with a cafe! Then its on the Eurostar back to London; across London, with bike, to the Manchester train, and finally home. He’s taking Monday off! Eleven hours in the saddle yesterday and after a late night, caused by waiting to board the ferry, Nick was up at 5.30am in order to get some breakfast on the boat before docking at 7am. He says he’s doing okay, but less aches and pains would be good! 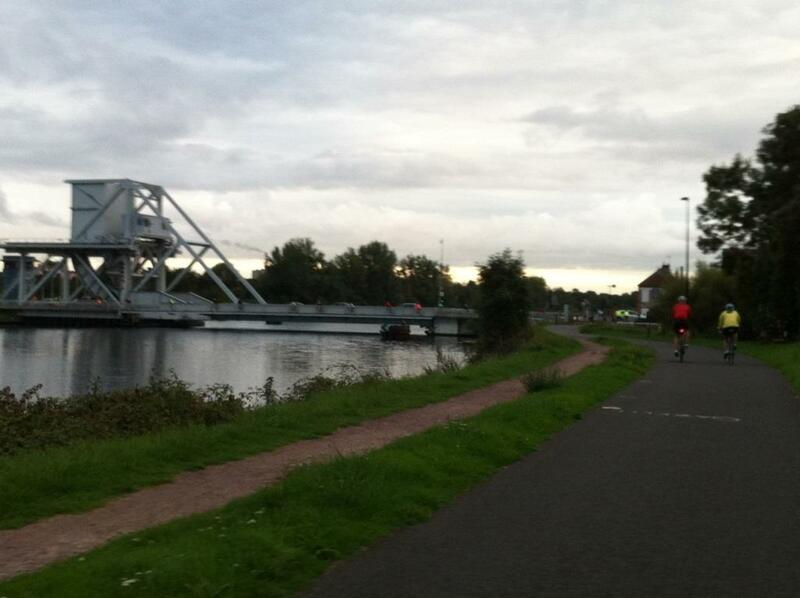 We do hope tiredness doesn’t make him forget to cycle on the left! Leaving Caen on a greenway, at least there was no traffic to deal with straight away. 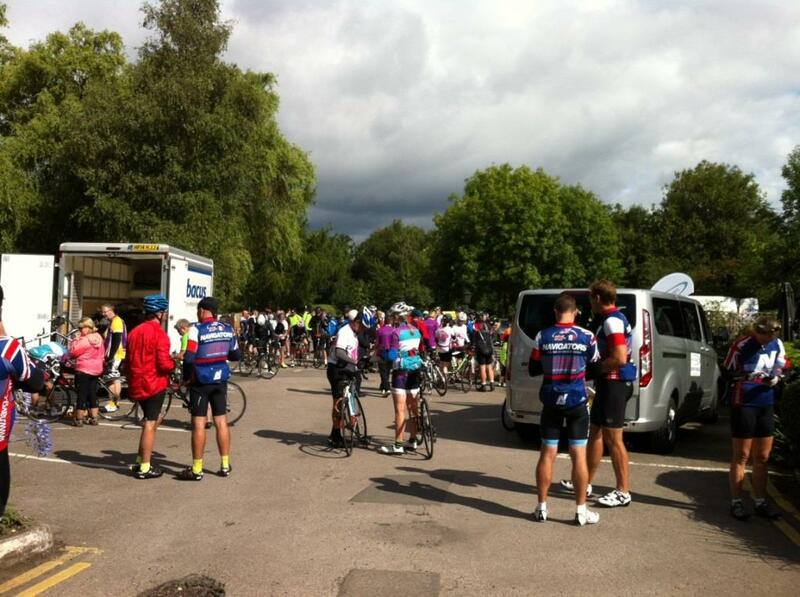 They cycle on towards Rouen, before heading on to quieter roads in the direction of Evreux. 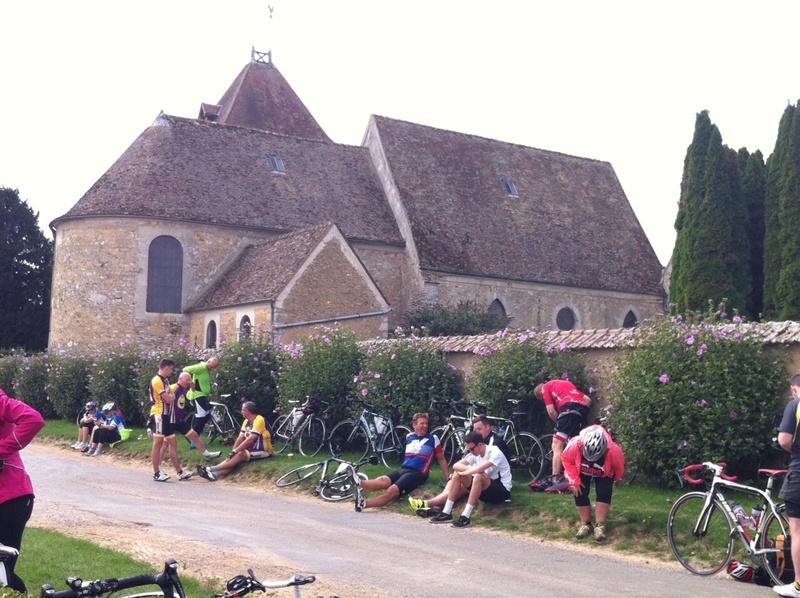 The landscape is rolling hills and quaint French villages typical of the region. A lunch stop in Thiveville, just north of Liseaux, very welcome. Nick’s pleased to discover that he’s definitely not the slowest cyclist, but is sticking quite close to the back of the pelaton. Better for the ego to move forward through it, than to drop back! 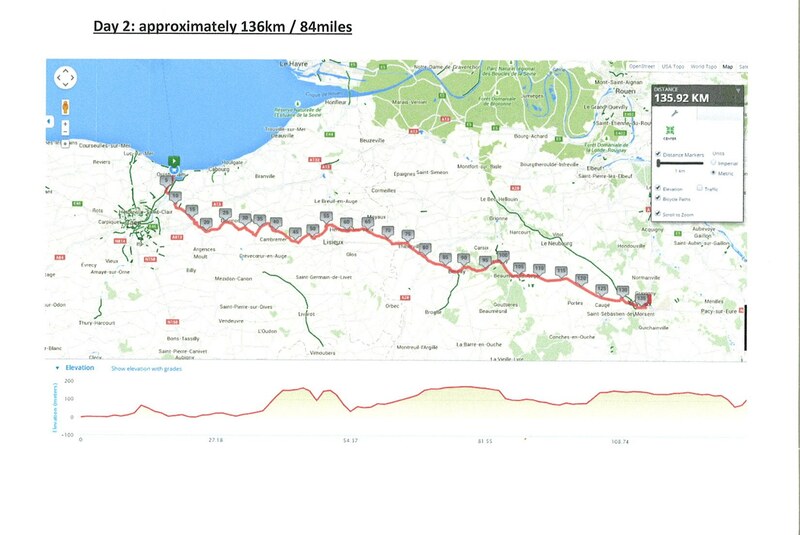 Following lunch they pressed on towards Evreux, and he’s completed day two. 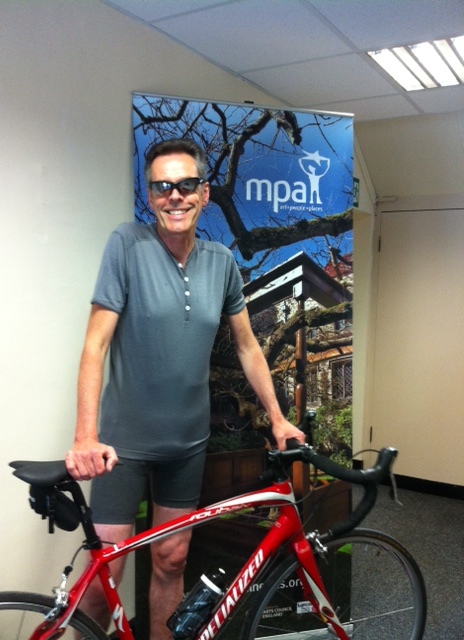 Nick arrived at 4pm, only a 9 hour day in the saddle today! Tonight’s about a good dinner and a proper bed – luxury after the ferry bunks. But will it be an early night for Nick or will he prefer a quiet stroll through the town and a nightcap at one of the many bars and cafes – hmm! 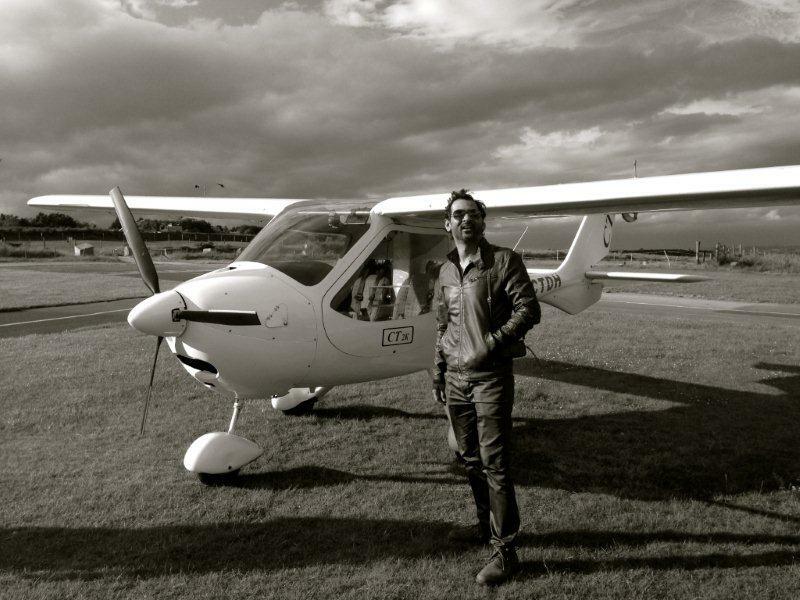 Final day tomorrow – Paris here he comes! 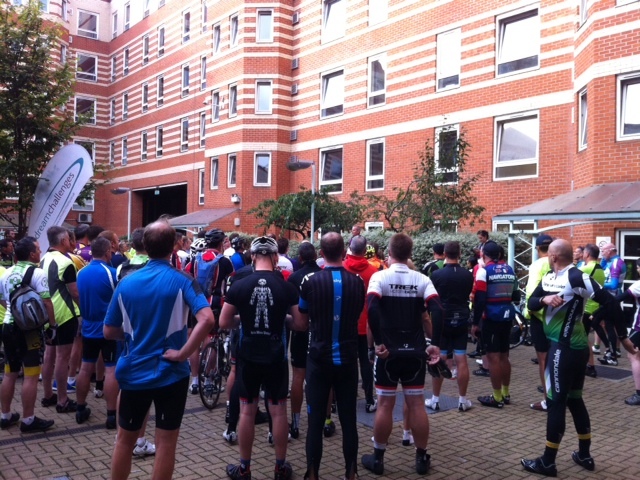 After an early morning briefing by the event leader the cyclists set off from central London at 8.30am. 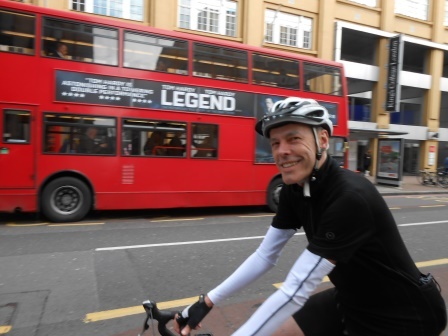 There are 120 on this challenge ride so Nick will, hopefully, have plenty of options of where to ride in the pack – although he probably won’t be up front with the speed merchants! From starting with the joys of London traffic they soon leave the hustle and bustle behind as they cross the North Downs, the first encounter with hills! A lunch stop near the town of Haslemere allows everyone to catch their breath before continuing across the beautiful, but very hilly South Downs. Then it’s into Portsmouth. 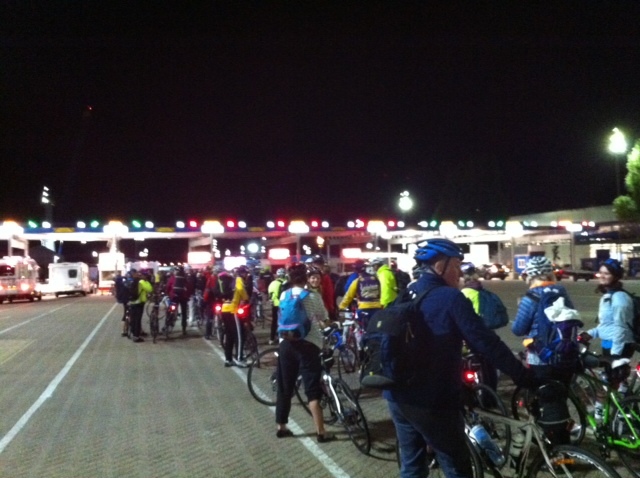 Nick got to Portsmouth at 7.20pm, an 11 hour day in the saddle! After a well earned dinner at a local hotel, and a chance to freshen up, there’s one more mile to ride to the ferry terminal, and then on to the ferry. Let’s all hope that the seas are kind and that Nick, and his fellow riders, can get some much needed sleep during the final part of the journey to Caen, especially as it’s a 7am start tomorrow. Mid Pennine Art’s Creative Director, Nick Hunt, reflects on the recurring intersections of art and two-wheeled sport that lured him into signing up to a distinctly foolhardy challenge. I blame Bradley. None of this would have happened without him or all that extraordinary stuff that happened through the summer of 2012. An Englishman winning the world’s greatest bike race, the Tour de France. Unheard of. And not any old lycra robot, but a proper laconic, old-style, neo-mod antihero. Allez Wiggo. And then the London Olympics, and the Cultural Olympiad, and all the extraordinary, euphoric moments of home-team success, all wrapped up in the discovery that London could be a place of collective joy where Tube passengers smiled at each other and mounted police high-fived spectators in the enormous, teeming crowds. And Wiggo blitzing the Olympic Time Trial was one of those amazing moments and surely life would never be so uncomplicatedly sweet again. 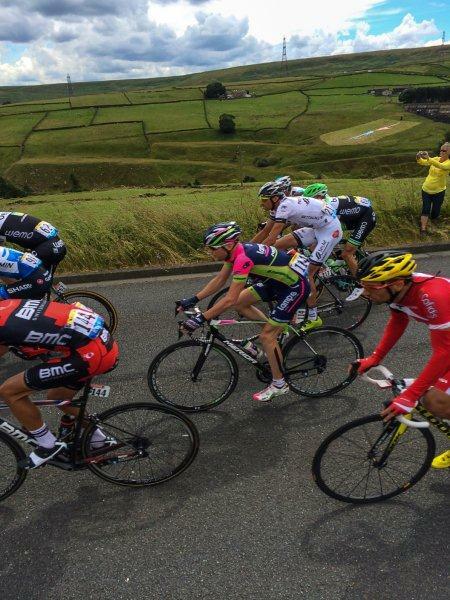 But then we heard that the 2014 Tour would come to the Yorkshire Pennines. And the rains stayed away, and the world saw the Pennines and the Dales at their best, and two million people came out to welcome Le Grand Depart and it was another once-only, euphoric experience. Not just that, but we were able to commission one of Pakistan’s most celebrated contemporary artists, although hugely in demand across the international art world, to come to a reservoir near Ripponden and create his first work in landscape. I blame, too, the Landmarks project, and the partners in Bowland Revealed who made it happen… As memories of Le Tour 2014 started to fade, my working life took on the onerous necessity of regular trips out into the Forest of Bowland AONB to meet artists, make site visits, progress check installations. It’s a tough job. I knew it was there, of course, Bowland, lurking somewhere the other side of Pendle Hill, but I kind of took it for granted. I had sort of overlooked that, north of Clitheroe, you soon slip into another, slower, pre-industrial, magical world of breathtaking beauty. Professor Tolkein’s Middle Earth. And if you approach stealthily, you get close to some peculiar fauna. Mamils, everywhere. Hordes of them. Many of quite mature years, like me. All putting in the miles while enjoying a particularly intimate engagement with that fabulous landscape. And I started to envy that connection, the breeze in your nostrils, the sun on your cheeks. And I started to think, if those often somewhat podgy seniors can do it, why not me? So Landmarks was a great project for us, but it cost me. To be precise, £650 of new-to-me carbon-framed hardware. And then I just needed a little extra motivation to get me out on it. MPA’s work has always celebrated our landscapes, and so over the years, it has found recurring connections with cycling, and cycle routes… The Padiham Greenway engagement programme, introducing 7,000 people to their new cycle route. Valley of Stone, commissioning sculptures for the lunar landscape of Lee Quarry’s extreme cycling trails. And this year we will renew those connections, as we pilot a programme of creative interventions for a new, countywide programme of strategic cycleways developments. But meanwhile… Coming up fast is MPA’s fiftieth anniversary, in 2016. We want to make the most of this landmark date, and need to raise extra funds to do so. We want to celebrate MPA’s work in a way that looks forward more than back. And how better than to promote a new opportunity for Lancashire’s next generation of artists? A competition award, yes, but one that comes with a real commission, to create something substantial in one of Lancashire’s special places… And we want to name it after the feminist writer and activist who inspired the founding of MPA back in 1966, Doris Nield Chew. Our award/commission will be The Doris. As a committed member of the APPL organisations Catalyst group, we are especially conscious at present of the need to encourage individual giving, and to crack the challenge of crowdfunding. So I started to think about what sort of individual challenge I could take on to help make The Doris happen. And at the creaky old age of 63, I have found one to stretch my ligaments to snapping point. But irresistible because it climaxes in Paris. 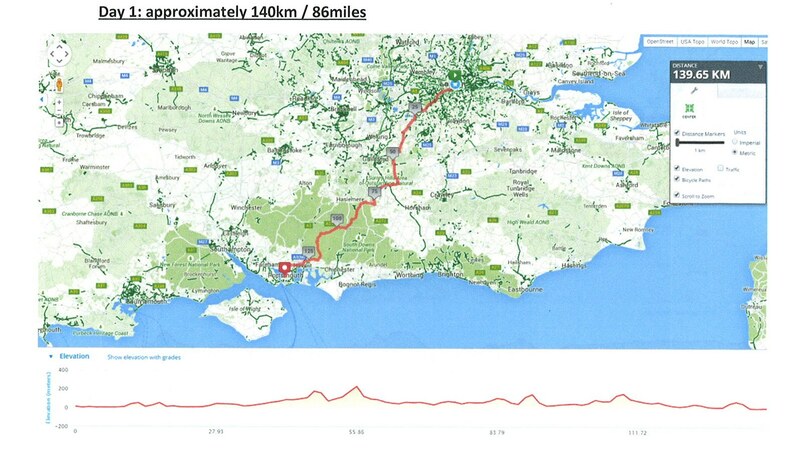 Three days in early September, London to Paris, around 80 miles a day. 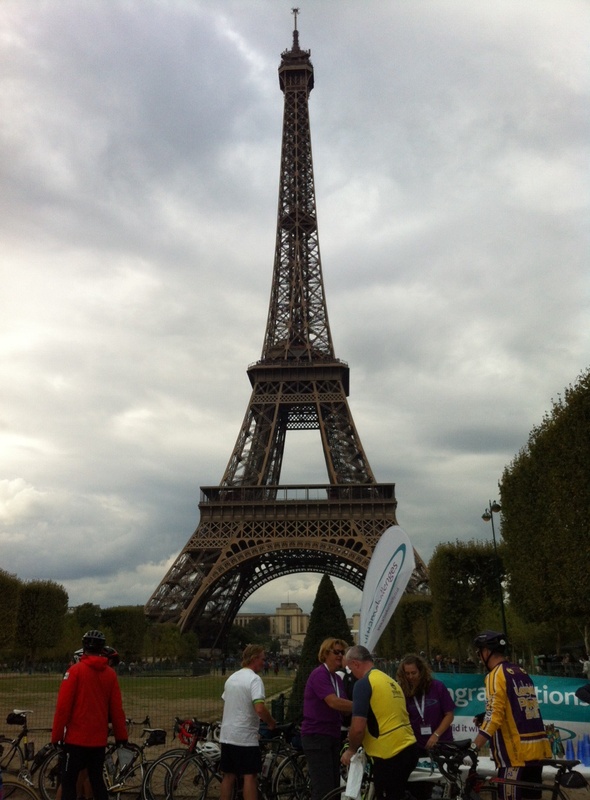 Arriving under the Eiffel, channeling a little bit of Wiggo 2012 of course. That’s the plan. Between now and then I just have to get on the bike, become a real rather than fantasy cyclist, put in the hard miles and toughen up all round. Simple. You can be sure that I, Mid Pennine Arts and the future recipients of The Doris will all be very grateful.